Step 1. Cut the madeira cake horizontally. Step 2. Spread both cut sides with jam, and then cut into small cubes. Place in a large bowl with half the strawberries. Step 3. Puree the remaining strawberries with 1 tablespoon of the caster sugar in the small bowl of a food processor or in a blender. Add the puree to the cake and toss gently to combine. Divide the mixture evenly among 4 heatproof glass dishes or cups and pour over half the custard. Step 4. Preheat the grill to high. Beat the mascarpone and remaining custard together until thick. Spread over the trifles then sprinkle with the remaining 2 tablespoons caster sugar. 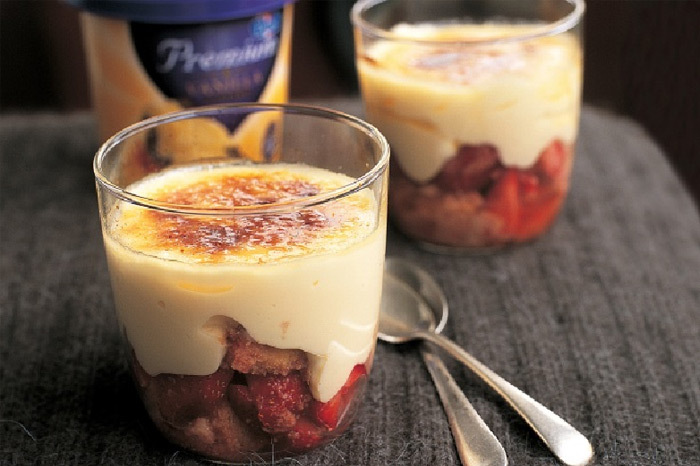 Place the trifles under the grill until the sugar melts and caramelises. Alternatively, use a domestic blow torch to caramelise.